In Mac OS X, a users short name is what their home folder is named after and it’s also the shorthand name for logging into the Mac either from a lock screen or a network connection with remote access through SSH and SFTP. There’s various reasons that you’d want to change the user short name, but it’s not just a matter of changing the name listed on a user account. We’ll cover four different ways to do this, a simple way that just changes the short user name for login purposes, and three more complete methods that will change not only the short user name but also the users directory name to match. Go with what is appropriate for your skill level. It’s important to note here that spelling matters, as does capitalization, any differences in spelling or capitalization and things will not work. Do not attempt to use a short user name or account name that has spaces or special characters, keep it simple with normal characters. Before proceeding, make sure you have a recent backup of your Mac and it’s important data. If you haven’t backed up in a while, you can force a manual backup in Time Machine easily. Once you’re backed up, read on. This is the method that Apple recommends on their knowledge base, this method may seem lengthy but it automatically handles the permissions and file ownership changes, making it easier for some users. For security purposes, Apple recommends disabling the root user account, but you can determine whether or not that is necessary based on how often you need to use root access. Then, through the same process of accessing the “Advanced Options” of the Account panel as mentioned above, you will select the newly renamed home directory as the users default by clicking on the “Choose” button and then navigating to it. If you chose to do this through the command line, this is more of a confirmation step. As with the other methods, you’ll want to confirm that everything is working by logging into the newly renamed account and opening and accessing files. On another note, you can also use this option to change the location of a users home directory. For example, if you have a small SSD drive for the operating system and applications to launch quickly off of but you want to keep all your files on a separate drive, but that’s branching onto a new topic. Yet another method to change the short user name exists and it’s quite a bit more advanced. Before beginning: Have a backup of your entire Mac done, this is editing user files and making changes to how the OS observes that user. If you don’t have a compelling reason to do this, or you aren’t comfortable with modifying system files and using the terminal, do not proceed. Also, you will probably want to enable Fast User Switching to be able to do this quickly. Done properly, you will have the short user name changed in just a few minutes, but this is not a traditionally supported method so proceed at your own risk! This has been verified to work in OS X Mountain Lion. Always make a backup before modifying important files. The short user name is now changed, but you’re not quite done yet. 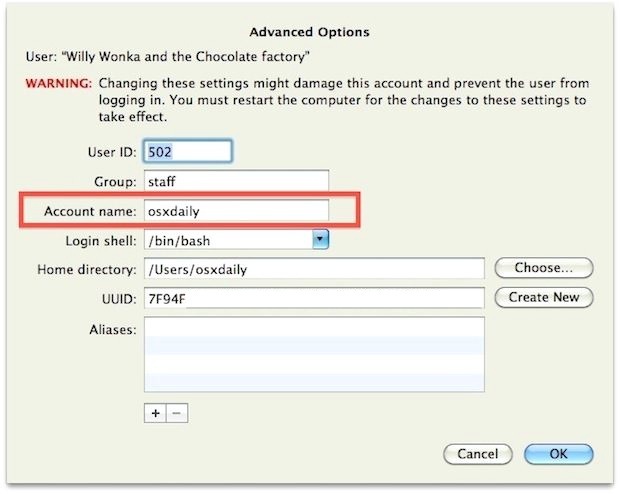 Log out of the currently active Administrator account, or use Fast User Switching to summon the Login window and then log in as the newly renamed user. i damaged my account and can’t login. what do i do? You’d have to go through the same process to make the exact change, but for such a minor thing it might be easier to just setup a username alias. this one is really usefull! Then I logged out and back in. Now I’m left with what seems to be a fresh os (background, dock reset, and pictures, and documents missing. All that seems to remain are apps that I had downloaded that don’t come with the system. I am running lion by the way. Did I really delete all my stuff or can this be fixed? I did the exact same thing, did you figure out how to fix it? how do i got to users ? There’s a quicker way to do all this. Change user name to whatever you want. Change your Macs Name to desired short name. Log in as root user and change the name of the home folder to your short name. Log out root and back in as user, right click on user name and change home directory to the home folder you renamed, it’ll say you have to restart, click ok. Sorry, also once it’s all done go to user and change your user to allow as an admin using root and the password you set earlier. Then turn root off to prevent security issues later. I LOVE YOU!!!! i just spent and hour looking how to change this, messing with everything in terminal, using all this non-sense….. all i wanted to change was the “CurrentDirectory User” THANK YOU!!!! I just did something really wrong. I typed in my new short name in home directory instead of account name. I rebooted and created a new account. Cant find and delete this account. Taking up masses of memory. %% needs to be in front of chown -R, (thats a CAPTIAL “R”). I find it appalling, the lack of specificity amongst the Mac community. And the sudo command above really not necessary. be sure to reboot your system after you change your short name and long name before you do anything else. follow all on screen prompts before you use any terminal commands. Apple’s support article HT1428: OS X: How to change user account name or home directory name, still refers to the old and buggy support article HT1528: Enabling and using the “root” user in Mac OS X. No one should ever need to enable the root user. This procedure is overly complex and buggy. If you really and truly need to act as the root user, use the Terminal and run the “sudo” command. Where “oldshortname” is your old user name and “newshortname” is the user name you want to change it to. Keep in mind that both oldshortname and newshortname must be all lowercase, with no spaces, and only contain letters or numbers. The “sudo” command will prompt your for a password. Enter the password you used when creating the new Administrator account and press “enter”. Nothing will be echoed on the screen. Use the Users & Groups pane (Accounts pane in Mac OS X v10.6.8 or earlier) in System Preferences to create a new user with the Account name or Short Name that you used in the previous step. Click OK when “A folder in the Users folder already has the name ‘account name’. Would you like to use that folder as the Home folder for this user account?” appears. Note: This will correct the ownership of all files in the Home folder, and avoid permissions issues with the contents. Log in as the newly created user. You should be able to access all of your original files (on the desktop, in Documents, and in the other folders of this Home). You will now need to rebuild the Spotlight index for your home directory. Follow the instructions in Spotlight: How to re-index folders or volumes and add your new home directory to the Privacy list and then remove it. This will trigger Spotlight to reindex your home directory and restore functionality of All My Files. After verifying that your data is as expected, you can delete the original user account via the Users & Groups pane (Accounts pane in Mac OS X v10.6.8 or earlier). As for the “root user” problem you will encounter in the iclarified article, you can always enable root commands in terminal by typing “sudo -i”. Although, if you follow the first one you’ll be home free. Now… Getting all that information and your UID back after you do that – Im still trying to figure that out right now, but I assume its essentially the same thing as the fix for this massive fuckup, albeit a modified terminal command with the correct chown -R command. Always use && before you type in commands like chown -R because && denominates the function thats typed after it to be run only if the first is successful. How do I update Java to the latest version?